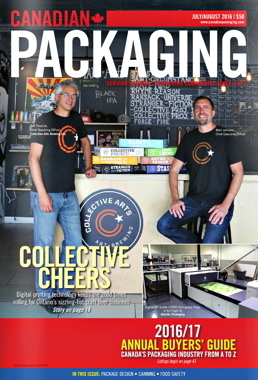 Hamilton craft beer startup quickly off to the races with premium-quality product range and dazzling packaging presentation enabled by the new generation of on-demand, short-run digital printing technologies. With new craft breweries springing up across Ontario far and wide at breakneck speed recently, it seems astounding that the southwestern city of Hamilton had to do without a proper hometown brewer for six long years after the 2007 sale of local stalwart Lakeport Brewing Company to Canadian beer industry giant Labatt Brewing Co. Ltd. Unable to find new tenants after all production of the notorious “buck-a-beer” Lakeport brand was swiftly moved to Labatt’s operations in London, Ont., the idled landmark factory on the city’s Burlington Street East thoroughfare seemed destined to share the grim fate of many other nearby manufacturers reeling from painful collapse of the once-mighty local steelmaking industry. But with the resilient city starting to turn the corner in recent years by diversifying its economic base and pursuing progressive urban renewal programs aimed at nurturing the local cultural and arts scene, the gutted building managed to spring back to life in truly inspirational style with some breathtaking creativity and technology-savvy packaging innovation. These days, the refurbished 65,000-square-foot plant is literally rocking the house to a brand new happy beat proudly conducted by long-time pals Bob Russell and Matt Johnston—co-founders of the fast-growing microbrewery Collective Arts Brewing Limited. 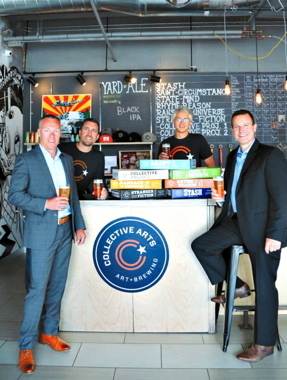 From Left: Joseph Campbell, vice-president of Atlantic Packaging’s Colour Group; Collective Arts Brewing’s co-founder Matt Johnston and chief operating officer Jeff Tkachuk; Atlantic Packaging’s national account executive John Stewart. Started up in 2013, the upstart microbrewer hit the ground running at rapid pace last summer following completion of a well-executed installation of a five-vessel, 60-hectolier DME Brewing Solutions brewhouse and packaging equipment put on the market by a decommissioned Nova Scotia-based brewery formerly operated by Sleeman Breweries Ltd. of Guelph, Ont. “There was absolutely nothing left here when we first came to the facility, as Labatt’s sold all the existing equipment as scrap, rather than allow for some new competitor to enter the beer market,” chief operating officer Jeff Tkachuk told Canadian Packaging during a recent visit to the lively 35-employee plant that now looks completely unrecognizable from the early days. “It took us a year just to perform all the structural repairs, including all the utilities, flooring, piping and electrical systems, before we could actually start bringing in the equipment to produce beer. “Fortunately for us, we had a unique opportunity to buy almost an entire brewery and packaging lines, even the office furniture, in one shot from the mothballed Sleeman plant,” Tkachuk recalls. Collective Arts initially honed its beermaking skills as a contract brewer at a Nickel Brook Brewing Co. facility in the neighboring town of Burlington, before starting up the refurbished Hamilton plant as a joint-venture company with Nickel Brook. After installing the first Hamilton plant’s fermenter at the start of 2015, Collective Arts was able to produce its first batch of craft beer in June of last year—formally resurrecting the plant’s long brewing heritage dating back to the late 1940s. With the plant’s 50,000-square-foot production area equally divided between brewing and packaging, the facility nowadays operates a busy 24-hours-a-day, five-days a week brewing and canning schedule, with its fast-speed bottling line typically operating three days a week. “We have spent a lot of money make sure this operation can accommodate our future volume growth,” Tkachuk says, pointing to substantial floorspace reserved to accommodate the arrival of additional fermenting vessels down the road. “All of our 18 fermenters are running at full capacity already, and we have placed an order for four more to arrive this summer,” he says. While the plant’s bottling usually runs at robust speeds of up to 250 bottles per minute, the existing canning line operates at a relatively slow rate of 25 cans per minute. Printed by Atlantic Packaging’s Retail Packaging & Display Division on the HP Scitex15500 digital printing press, the decorative corrugated trays provide an effective shipping carrier as well as a high-impact shelf display at retail level. However, Tkachuk says the brewer is on the verge of resolving that imbalance with a pending installation of another similar canning line, along with an automatic depalletizer, to double the plant’s canning capacity and output. Remarkably, the premium-quality beer brands produced by Collective Arts are already retailed throughout most of Canada, with the exception of British Columbia, and will be available in Europe and the U.S. in coming months. “We operate differently from most other Ontario craft brewers in that we are not land-locked to any one specific geographic region,” remarks Tkachuk, a Toronto native who left behind a lucrative career in financial services to help start up Collective Arts, using previous work experience to attract private investment capital to finance the venture. While Tkachuk acknowledges that the Ontario craft beer market is now getting pretty crowded with many new startups jumping on the bandwagon, he explains that Collective Arts never intended to enter the market as just another ‘me too’ copycat microbrewer. 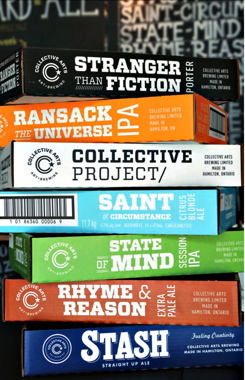 In addition to its far-f lung market reach and whimsical attention-grabbing brand names—including Saint of Circumstance, State of Mind, Rhyme & Reason, Ransack the Universe and Stranger than Fiction—the brewer’s truly unique approach to the labeling of its beer is unlike anything the Canadian craft beer business has seen until now. A sampling of the varied original artwork faithfully recreated on the full-body shrinksleeves, supplied by Safety Seal Plastics, used to decorate the 473-ml aluminum cans shipped to the Hamilton brewery by TricorBraun Canada. Instead of running rollstock labels with the same graphics and image bottle after bottle, Collective Arts goes through great lengths to ensure that each passing bottle on the line looks different from the ones labeled just before and after. To achieve this variability, the brewer uses dozens of different high-res images reproduced from a broad range of limited-edition artwork submitted to the company online by up-and-coming artists, musicians, film-makers and other contributors from around the world. Featuring 70 different label designs per roll, all pre-arranged in a special sequence to avoid repetition, this seemingly random labeling makes each bottle or can a unique work of art, so to speak, with the result that virtually each container in a given multipack of the same brand of beer boasts its own unique label. “So a consumer buying a six-pack of bottles is guaranteed to end up with six different labels inside that one same pack,” says Tkachuk. It’s a same-but-different labeling approach for the canned products, whereby the rolls of pre-printed shrinksleeves, supplied by Safety Seal Plastics Inc., feature four different artworks for each brand—repeated in same sequence. “So the customer purchasing a flatpack or a tray of cans would then have at least four different designs in it for the same brand,” says Tkachuk, crediting the Markham, Ont.-based TricorBraun Canada for supplying Collective Arts with the high-quality 355-ml dark-tinted glass bottles and the 473-ml Tallboy-style aluminum cans. (Left) Featuring embedded AR (augmented reality) technology activated by a Blippar app, the artwork used to decorate the aluminum cans comes to life after being scanned with a smart mobile device to reveal the full story behind the featured submission. (Right) Printed by Maritime Labeling and Packaging, the high-quality beer bottle label pictured above can be scanned by any mobile device with a Blipper app to get the highly interactive and informative Collective Arts experience behind the original artwork. “We also match up the full-bodied shrinksleeves with the artwork that provides the best visual match for the brand, using images that work best against a blue, green, brown, yellow or other background label color used for the different canned brands. tongue-in-cheek manner to capture the consumers’ attention and pique their interest. To top it all off, each of the high-quality bottle labels and wraparound can shrinksleeves is embedded with ultra-hip Web-based AR (augmented reality) technology activated on smart mobile devices with a free interactive app developed by Blippar, a rising technology innovator that had previously enabled some popular cereal brands, including Cheerios, to initiate a highly engaging interactive AR experience for the more inquisitive consumers. With the Collective Arts packaging, each label is literally brought to life using a free Blippar mobile phone app to scan the label and hear the music, see a video, or read up on the artist’s biography on the device’s screen. With Collective Arts paying contributors modest rights fees for the selected images, the resulting virtuous cycle of digital brand marketing and public exposure for budding creative talent is a win-win for all involved, Tkachuk asserts, keeping the brewer’s design options continuously expanded and refreshed. 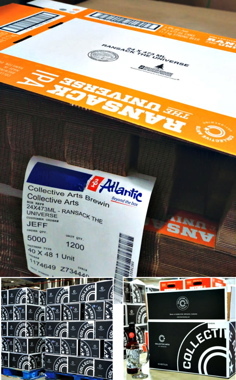 “It took us a while to find a label supplier capable of digitally printing our labels in the required sequences,” notes Collective Arts chief executive officer Johnston, crediting the Bedford, N.S.-based Maritime Labeling and Packaging for rising to the unusual challenge with highly flexible digital label printers featuring the required short-run, on-demand, quick-changeover print capabilities. “Naturally it costs us a little more to have all our labels printed digitally, but it’s a core part of how we differentiate ourselves in the market,” says Johnston, estimating Collective Arts has by now contributed about $100,000 to the arts community in image rights fees and other related promotions. As Johnston relates, “Three years ago, Maritime Labeling was the only supplier who was really able to wrap their heads around our labeling concept and to make these labels in enough quantities for a reasonable price. 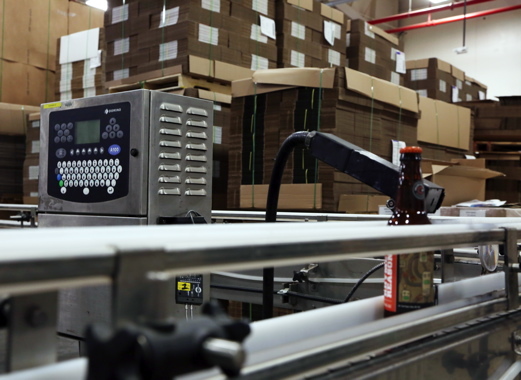 In addition to supplying Collective Arts with digitally-printed shipping trays for the canned products, Toronto-based Atlantic Packaging also provides the brewer with high-quality corrugated boxes to package its bottled-beer multipacks. “We work hard to make each individual can something of a work of art with a high aesthetic value,” reasons Johnston, “so the last thing we would want to do is place them in some generic brown-board tray—it just defeats the whole purpose. “We spend so much time and money collecting the art and making sure that it looks amazing on the shelf, that trying to cut corners by using the lowest-cost secondary packaging to bring those cans to market is a non-starter,” Tkachuk asserts. “I’m pretty sure that all our packaging here costs considerably more than for all other craft brewers I can think of,” says Johnston, “but that’s what makes us stand out in the marketplace—delivering the whole proverbial ‘full package’ to the market. “All of our packaging is scannable with a smart mobile device,” Jonhston enthuses. “Even our coasters are embedded with scannable AR codes that will let you play the music of the band featured in the artwork, let you read the bands’ biography, follow them on social media and so on. art featured on the Collective Arts bottles and cans. 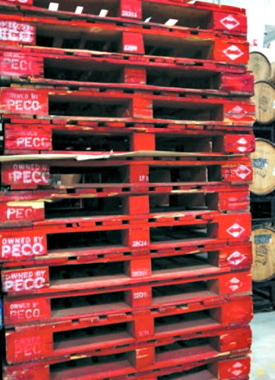 The Collective Arts beermaking plant in Hamilton uses a variety of pallets to ship its product, including those manufactured and rented out by PECO Pallets, Inc. 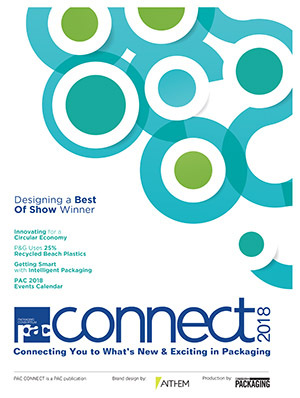 While the corrugated shipping trays supplied by Atlantic Packaging are not at this point AR-embedded like the bottle and can labels, they play a huge role in maximizing the Collective Arts brand equity throughout the distribution, Tkachuk points out. 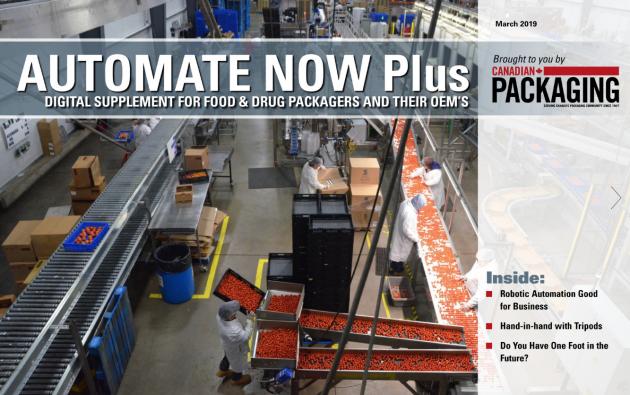 “For a lot of retailers, your shipping carton is also your point-of-purchase display, so we don’t want our high-end vessels to be sitting on a store-shelf in a tray or carton that does not meet the same high quality standards,” he explains. “The construction quality of their trays is a lot higher than what many other suppliers offer,” Tkachuk confides, “and the pricing is very competitive. “Being fairly new to the industry, we want to work with suppliers who are willing to grow with us and to invest in us for the long run. “We have been dealing with Atlantic Packaging from fairly early on in our life-cycle, when we were only doing bottled beer,” he relates. 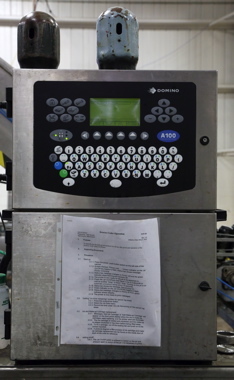 (Above and below) A Domino A1000 small-character inkjet printer is used by the Collective Arts brewery to apply production dates, codes and other pertinent variable product information directly onto the cans’ surface area using safe food-grade inks. With time being of the essence, Collective Arts turned to Atlantic Packaging to help find a way to produce the required limited quantities of trays to accommodate the brewer’s relatively small canning volumes without breaking the bank. 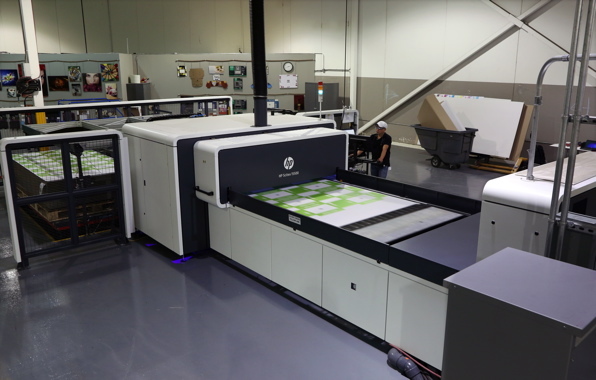 As it turned out, the timing could not have been better, as Atlantic Packaging’s Retail Packaging & Display Division (formerly called Add Ink) had just completed the installation of a state-of-the-art HP Scitex 15500 digital printing press at its 190,000-square-foot facility in Toronto’s northeast end. Designed specifically for printing across the whole range of corrugated board grades and thicknesses with breakthrough color inkjet printing technology that does not use any printing plates, the spanking brand new press—manufactured in Israel by HP Development Company, L.P.—provided the perfect cost-effective solution for the Collective Arts’ short-run print requirements, according to Tkachuk. “Our early canned beer volumes could not justify us investing into conventional printing plates for long-run press production,” he says, “but with their new digital press, they (Atlantic) can ship us a set of 500 beautifully-printed trays within days of order placement. “The fast turnaround that Atlantic provides for us is just spectacular,” he extols. Such unqualified endorsement is one of many good reasons why Atlantic Packaging made a significant investment in becoming the first Canadian company to install the new-generation HP Scitex 15500 digital printing press in the country. 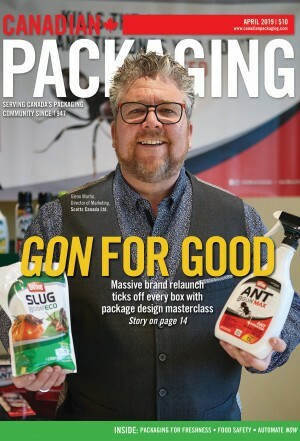 “We are immensely proud to be an industry leader in being able to offer this kind of corrugated packaging to our customers,” states Joseph Campbell, vice-president of Atlantic Packaging’s Colour Group business. 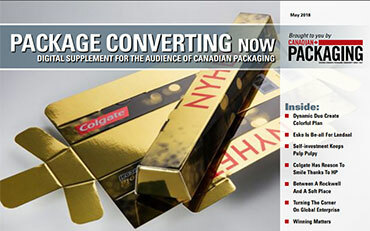 “It is an important competitive edge,” Campbell told Canadian Packaging on a visit to the division’s lively, clean and spacious facility employing 88 people to produce a diverse range of corrugated packaging solutions—from simple shipping carriers to sophisticated retail-ready shelf displays and towering, multicolor POP (point-of-purchase) displays. A recent arrival to the Atlantic Packaging Retail Packaging & Display Division’s production facility in Toronto’s east end, the state-of-the-art HP Scitex 15500 digital printing press is processing a sheet of corrugated board used to make a new batch of carrying trays that will be used by Collective Arts to ship its canned beers to the retail customers. Celebrating its 70th anniversary just last year, Atlantic Packaging boasts a proud track record of continuous investment in next-generation production machinery throughout its illustrious history, and the company’s purchase of the new HP Scitex 15500 press, along with a side-by-side fully-automatic Kongsberg flatbed cutting table, is a resounding confirmation of that progressive tradition and mindset, according to Campbell. box die-cutting and folding within moments of printed sheets coming off the press. 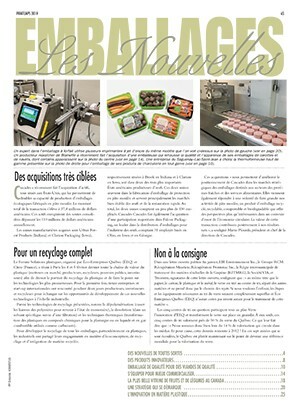 Controlled via an operator-friendly touchscreen interface (inset), the HP Scitex 15500 corrugated press uses low-odor HP HDR230 Scitex inks to enable cost-efficient, noncontact printing on paperboards of various grades and thicknesses to provide an optimal solution for short-run production of corrugated trays and other packaging products and displays. 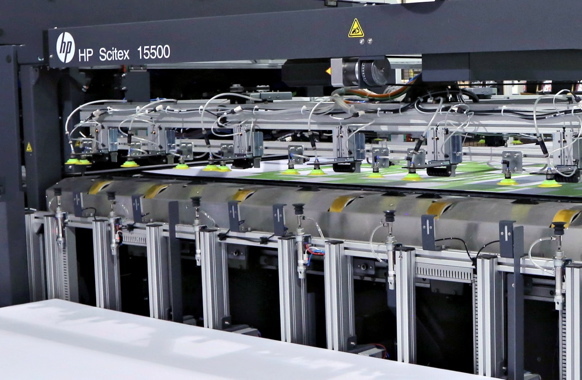 Conversely, the HP Scitex 15500 press also provides a highly efficient solution for longer print runs of up to 2,500 boxes, Campbell explains, which are then die-cut and folded on the more conventional folder/gluer machines in another area of the plant. Using proprietary low-odor HP HDR230 Scitex inks, the new press achieves brilliant color reproduction on corrugated board of just about every grade and thickness, even handling severely warped boards by automatically flattening and holding them down throughout the printing process. “This six-color press enables us to attain up to 85 per cent of the entire color gamut,” says Campbell, adding the plant’s in-house graphics team can then capably fill in any gaps with special formulations and finishing techniques to achieve the required brand colors spot-on. Capable of achieving print speeds of up to 650 square meters (6,997 square feet) per hour, the press can handle board thicknesses from 0.8-mm up to 25-mm to turn out up to 127 full-sized printed sheets per hour at maximum capacity. Installed in March of this year, the HP Scitex 15500 press has already been put to good productive use at the busy plant, according to Campbell, nowadays consistently running a full shift five days per week. As Campbell explains, the division’s growth strategy is built on three core pillars of speed-to-market, innovation and customer experience. “This press is providing us with the perfect support for that growth strategy. 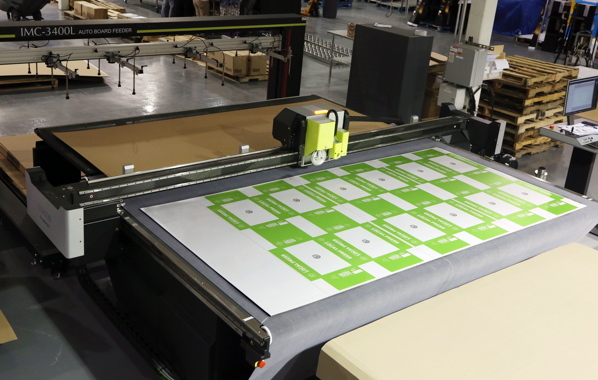 Strategically positioned about 20 feet across from the nearby HP Scitex 15500 corrugated press, the fully-automatic Kongsberg digital flat-bed cutting table is used by the Retail Packaging & Display Division facility to die-cut the digitally-printed sheets. Says Campbell: “We are usually printing and die-cutting an incoming run within a day, if not hours, of receiving an order, or even just a concept of what a box should look like. “As for innovation, being the first in Canada to have this technology enables us to offer our customers solutions that even they did not think were possible,” Campbell explains. Insofar as customer experience, Campbell says Atlantic spends a lot of time learning from market leaders across a broad range of industries to implement the best-in-class practices for creating value-added to exceed customer expectations. “There are a lot of our customers now having real ‘Wow’ moments because of the work we have done with this press for them,” says Campbell. “They see something that was not possible with existing methods being made possible, like creating little on-box promos for future products, for example, by simply adding a few extra promo graphics and copy right inline at virtually no added cost. “This results in customers getting more engaged with us as a real business partner,” says Campbell, “which is at the heart of what we do. “This is especially true in the craft beer business, where customers like Collective Arts can order 10 runs of 500 boxes, with 10 different graphic designs, rather than one run of 5,000 boxes of the same design, at virtually the same cost,” Campbell relates. “There is a lot of growing interest in the Ontario craft brewing industry in what we can offer them with our HP digital printing capabilities that no one else can right now,” Campbell sums sup. “In terms of established conventional printing processes, digital printing is a hugely disruptive technology that will have a profound impact on the corrugated packaging business and the industries it serves—especially in the innovation-driven craft beer sector, ” he concludes.